Rock ‘n’ Roll Raleigh Marathon & Half Training Update #1 and Discount Code! Training for my upcoming races has been going well. 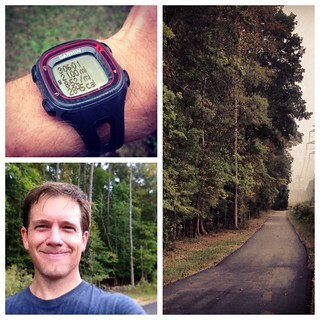 I was just out on the Neuse Greenway trail yesterday and completed my longest training run to date at 21 miles! It took me a little over 3 hours to complete but I felt strong and injury free. I do have a few races before the Rock ‘n’ Roll Raleigh Marathon and Half-Marathon on April 13, 2013, but I have my mind set on this particular race as I work towards my goal of a new personal record for the half marathon distance. I really want to beat my previous half marathon time of 1:53:52 and plan to make this happen at the Rock ‘n’ Roll race. Over the past few months I have settled into a nice manageable training program to build a nice base and increase my endurance on longer distances. I typically run 3 times during the week followed by a long run on Saturday. My weekday runs are usually something along the lines of a 5 miler on Tuesday, an 8-9 miler on Wednesday, and then 5 miles on Thursday. I do the majority of my training runs on the Neuse Greenway Trail since I live so close to it and it provides a scenic course to run along the river. I take Friday off to rest then Saturday I do my long run which I slowly increase by 1 mile each week. I’ve also started riding a bike on Mondays to work out the kinks from my weekend long run and it has been doing wonders for my legs. I also have continued my strength training at my local gym, O2 Fitness, by attending at least one or two group exercise classes each week (typically BodyPump). Run Clubs – A fun way to keep motivated! 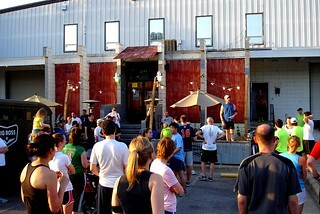 A big part of my weekday training is participating in local run clubs. These aren’t training clubs in the traditional sense. They are actually social run clubs filled with runners of all levels who are looking to run with likeminded people and socilaize. 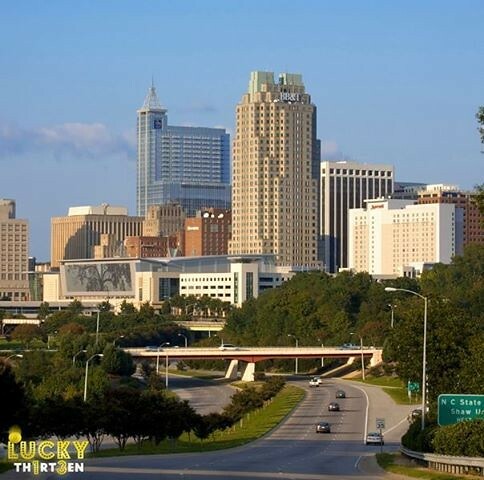 Two of my favorite social run clubs are the Tuesday night Big Boss Run Club which meets at the Big Boss Brewery just outside of downtown and the Thursday night River Run Club which meets at DeMarco’s Restaurant & Bar in North Raleigh. I’ve met a lot of great people at both clubs and enjoy having people to run with and learning from some of the more experienced runners who are always ready to share their race experiences and training tips. It is also nice to support the great local businesses like Big Boss and DeMarco’s, both of which are awesome hosts to the runners. If you haven’t singed up for the race yet, you can take advantage of a special discount code when you register on the 13th of the month. Register today (October 13th) with the online code LUCKY13 to receive $13 off your next race entry. Visit the registration page here. In addition to saving $13 keep in mind that you’ll want to register soon to beat the 10/31 price increase. 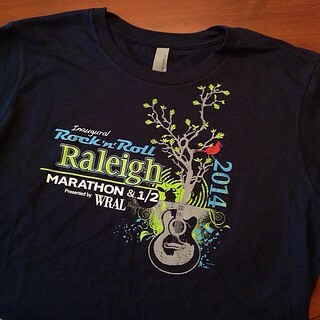 Rock ‘n’ Roll Raleigh T-Shirt Giveaway! The nice people behind Rock ‘n’ Roll Raleigh were nice enough to send me a few free t-shirts to giveaway on my blog. If you would like one drop me a line at TriangleExplorer at gmail dot com and I will try and coordinate a way to get one to you (possibly by catching up at one of the local run clubs!). Supplies are limited and shirts will be given away in the order I receive requests. If I get any additional shirts or swag items to giveaway I will announce it in future updates. 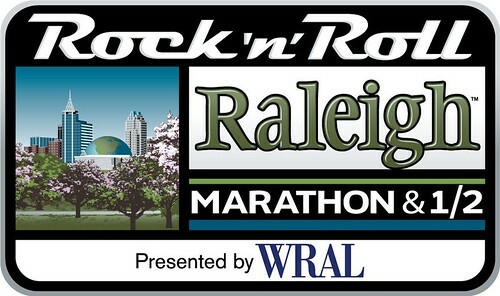 The Rock ‘n’ Roll Raleigh marathon takes place April 13, 2014 and will feature bands positioned on stages along every mile of the scenic course throughout Raleigh, interspersed with cheerleaders & themed water stations. The running experience is topped off with a finish-line concert downtown featuring a major headline act.The Rock ‘n’ Roll Marathon Series has raised more than $283 million for charity in the last 16 years. Reminder: If you don’t take adavantage of the October 13th discount, you can continue to use the unique discount code I’ve been given to share with my Triangle Explorer readers. Save $10 by using the discount code “TRIEXPLORERAL10” when you Register online at the Rock’n’Roll Marathon website. This code will work as long as you register before April 6, 2014 and is good for both the full and half marathon. Sounds like your training is going great! I am planning on running the Full here at the inaugural race. It’s on my 44th Birthday and would love a shirt! I’m local, and could always send you shipping costs via mail. Let me know! Thanks, and keep up the good running. I got your email. Unfortunately the response was a bit overwhelming and I am out of t-shirts at this point. I will keep a running list of people who contacted me in get in touch if I get any more. Thanks! It was great to meet you at RRC last Thursday. I hope to see you again soon. Love your blog!! Thanks Jen! I appreciate I you checking out the blog. Love the RRC! !